6 would there be enough evidence to convict you? 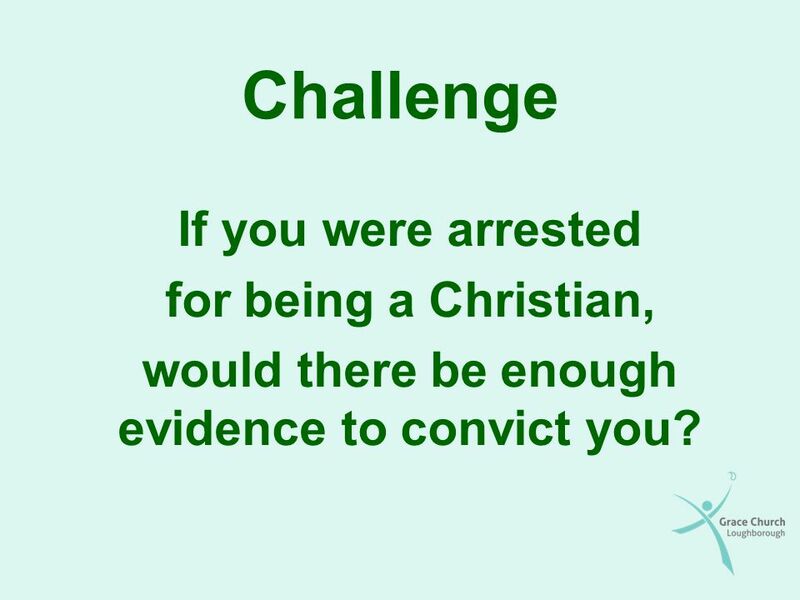 Challenge If you were arrested for being a Christian, would there be enough evidence to convict you? 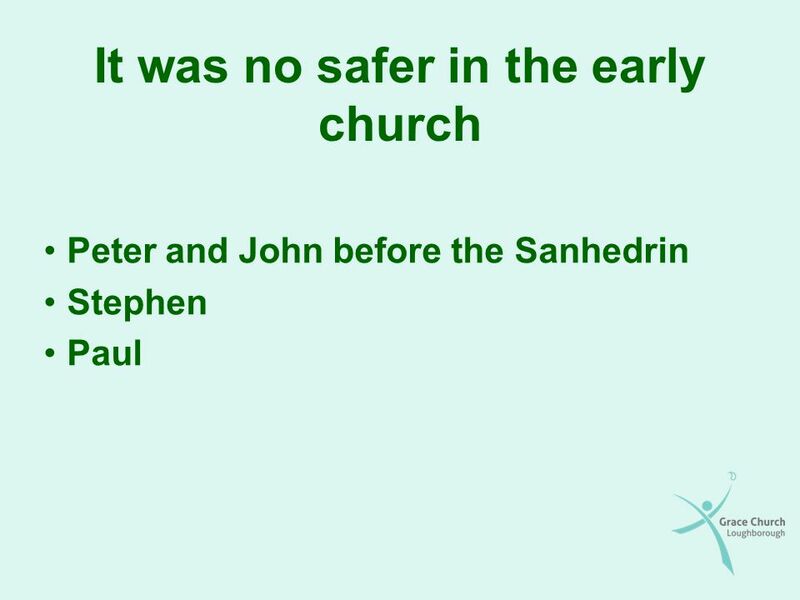 Peter and John before the Sanhedrin Stephen Paul Acts 4: Then they called them in again and commanded them not to speak or teach at all in the name of Jesus. But Peter and John replied, "Judge for yourselves whether it is right in God's sight to obey you rather than God. For we cannot help speaking about what we have seen and heard.“ After further threats they let them go. 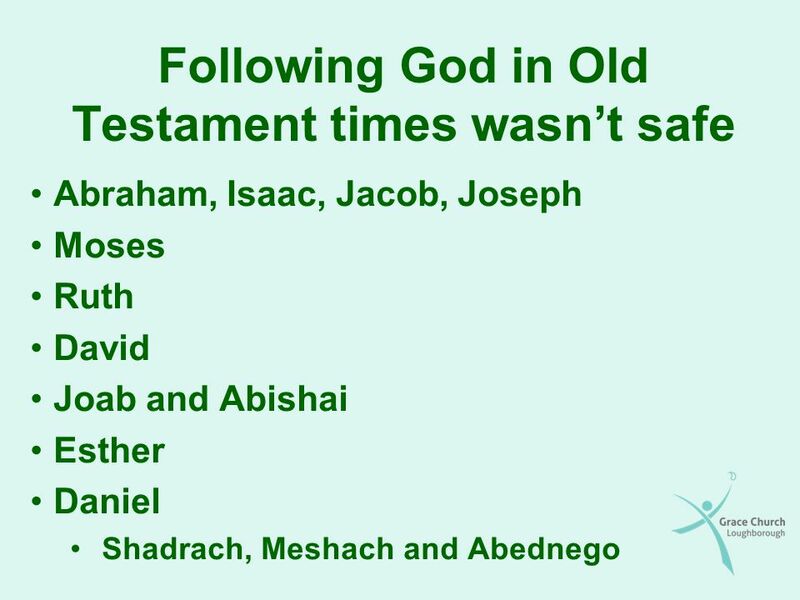 They could not decide how to punish them, because all the people were praising God for what had happened. Acts 9: "Lord," Ananias answered, "I have heard many reports about this man and all the harm he has done to your saints in Jerusalem. And he has come here with authority from the chief priests to arrest all who call on your name.“ But the Lord said to Ananias, "Go! This man is my chosen instrument to carry my name before the Gentiles and their kings and before the people of Israel. I will show him how much he must suffer for my name.“ 2 Cor 11: Are they servants of Christ? (I am out of my mind to talk like this.) I am more. I have worked much harder, been in prison more frequently, been flogged more severely, and been exposed to death again and again. Five times I received from the Jews the forty lashes minus one. Three times I was beaten with rods, once I was stoned, three times I was shipwrecked, I spent a night and a day in the open sea, I have been constantly on the move. I have been in danger from rivers, in danger from bandits, in danger from my own countrymen, in danger from Gentiles; in danger in the city, in danger in the country, in danger at sea; and in danger from false brothers. I have laboured and toiled and have often gone without sleep; I have known hunger and thirst and have often gone without food; I have been cold and naked. 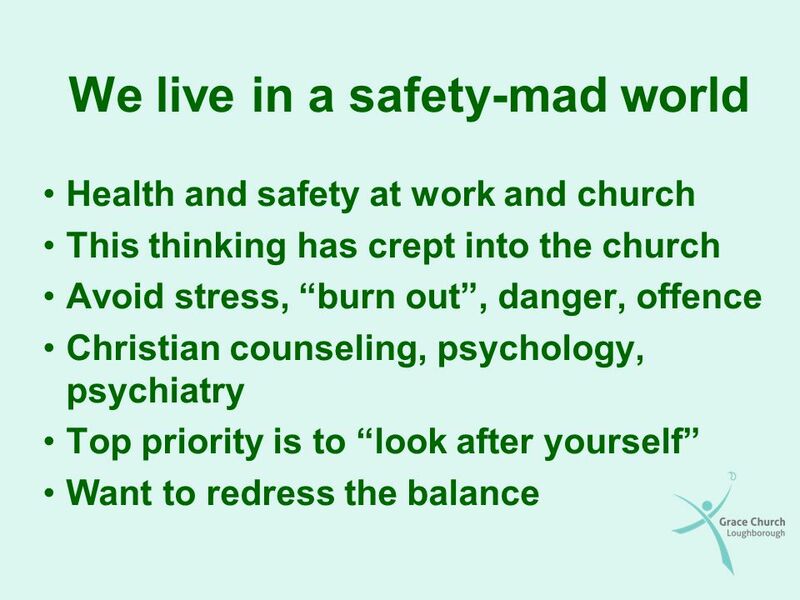 Besides everything else, I face daily the pressure of my concern for all the churches. 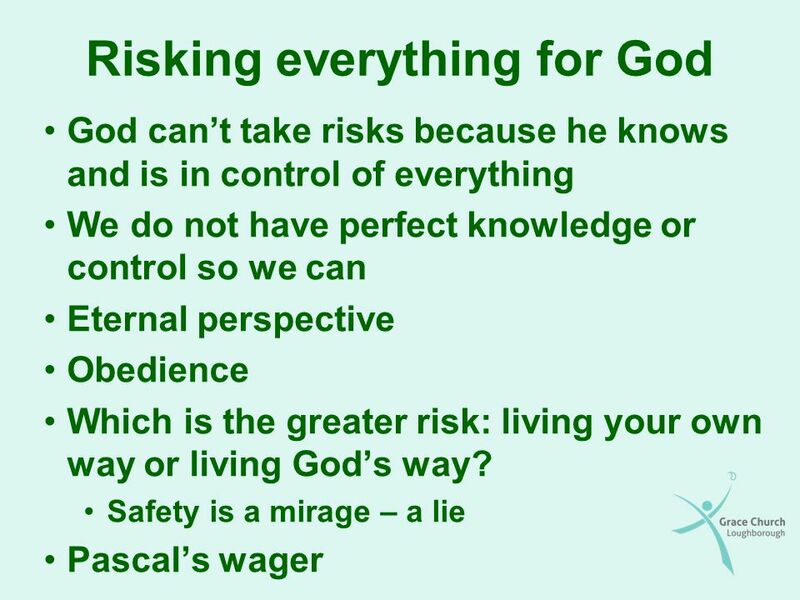 God can’t take risks because he knows and is in control of everything We do not have perfect knowledge or control so we can Eternal perspective Obedience Which is the greater risk: living your own way or living God’s way? 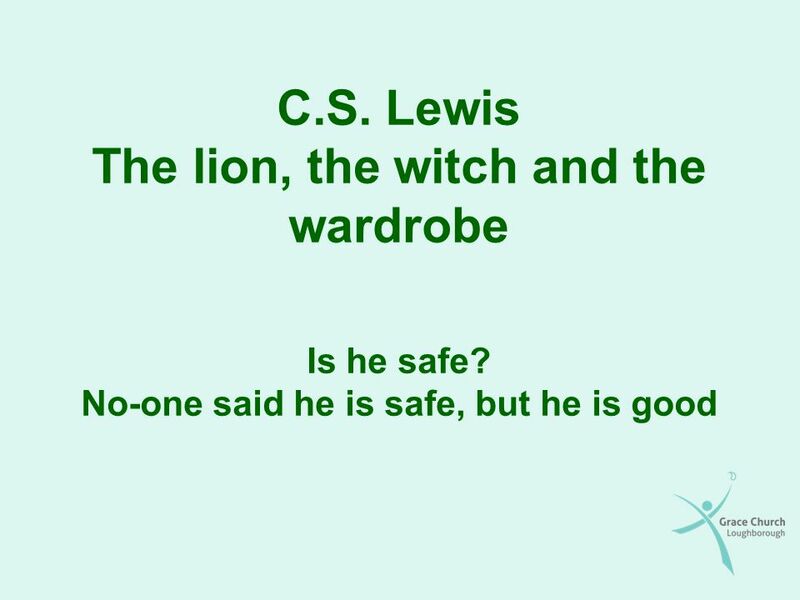 Safety is a mirage – a lie Pascal’s wager 3 pictures in todays passage: soldier, athlete, farmer Mark 9: "And if anyone causes one of these little ones who believe in me to sin, it would be better for him to be thrown into the sea with a large millstone tied around his neck. If your hand causes you to sin, cut it off. It is better for you to enter life maimed than with two hands to go into hell, where the fire never goes out. And if your foot causes you to sin, cut it off. It is better for you to enter life crippled than to have two feet and be thrown into hell. And if your eye causes you to sin, pluck it out. It is better for you to enter the kingdom of God with one eye than to have two eyes and be thrown into hell, where "'their worm does not die, and the fire is not quenched.' Luke 12:4-5 – “I tell you, my friends, do not be afraid of those who kill the body and after that can do no more. But I will show you whom you should fear: Fear him who, after the killing of the body, has power to throw you into hell. Yes, I tell you, fear him. 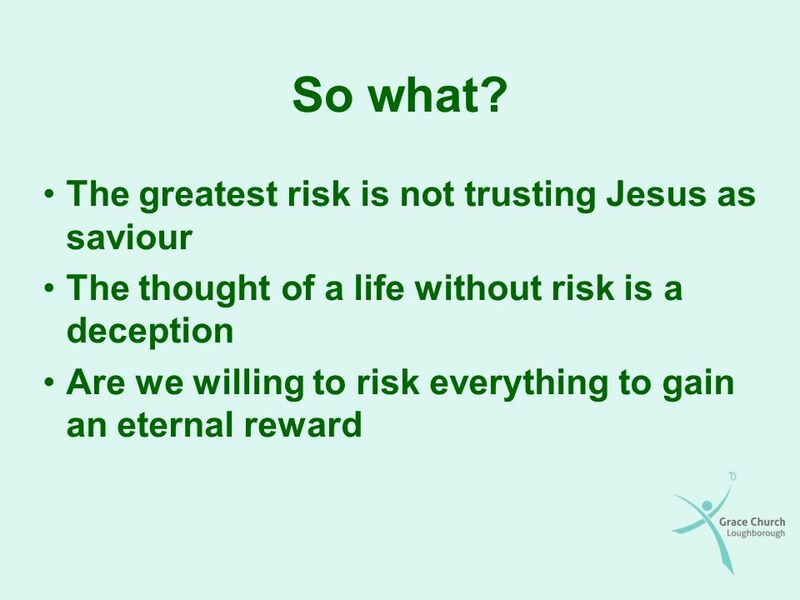 Download ppt "Risking all for the sake of the gospel"
I WONDER HOW IT FELT I wonder how it felt, to wake up in the belly of a whale? I wonder how it felt, to spend the night with Silas in the jail? Sometimes we might think: "Is there anyone who can really under stand me?" "Is there really someone who knows what I’m going through?" The Bible declares. Teach Us To Pray Luke 11:1. * Intercession is the act of carrying another person before your Father to be blessed by His will. * It is an act of love. Philippians 3:1-3; 4:4 (NKJV) Chap 3 1 Finally, my brethren, rejoice in the Lord. For me to write the same things to you is not tedious, but for you it. Almost Persuaded Almost Persuaded Acts 26:27-29 Acts 26:27-29. God’s Sovereignty All authorities are instituted by God and as Christians we submit to these authorities to obey God, not man. SUSTAINING THE HARVEST FORCE IN A HOSTILE WORLD SURVIVING THE HOSTILITIES. 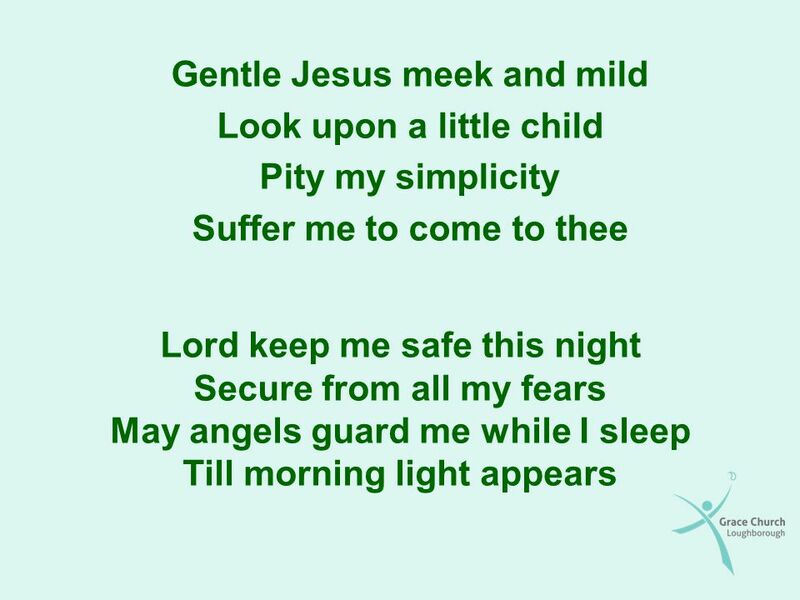 Living in the Light of the Lordship of Christ. BOOKLETS 1.Suggested donation of $2 for small and $3 for large. 2.Write your name in front. 3.Memorize. Isaiah 55:8-9 “For my thoughts are not your thoughts, neither are your ways my ways, says the Lord. For as the heavens are higher than the earth, so are. 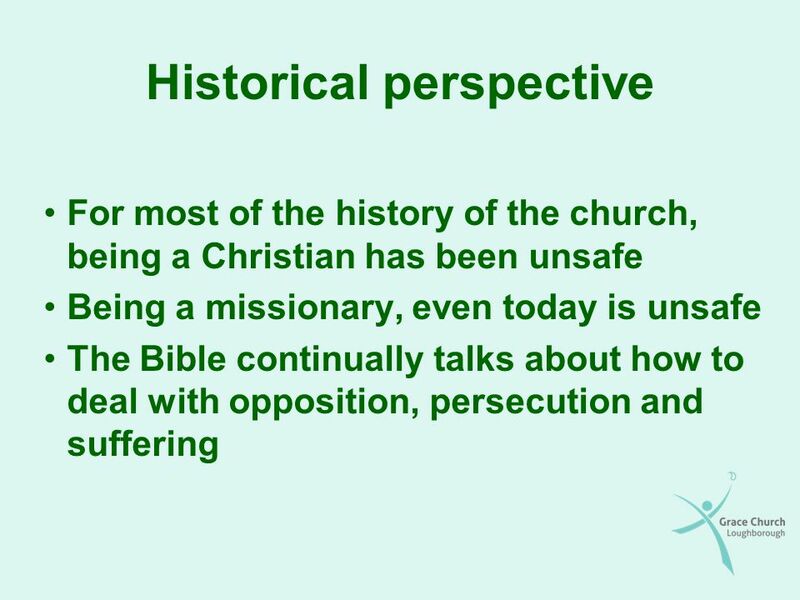 “Committed, Persecuted & Blessed” In Jesus’ teaching (Matthew) In the early church (Acts) In Paul’s life (2 Corinthians) In today’s church In me? A Christian Named Paul Acts 9: Introduction Identifying with Paul the apostle –He could work miracles –I can’t do that See him as a Christian –Can. 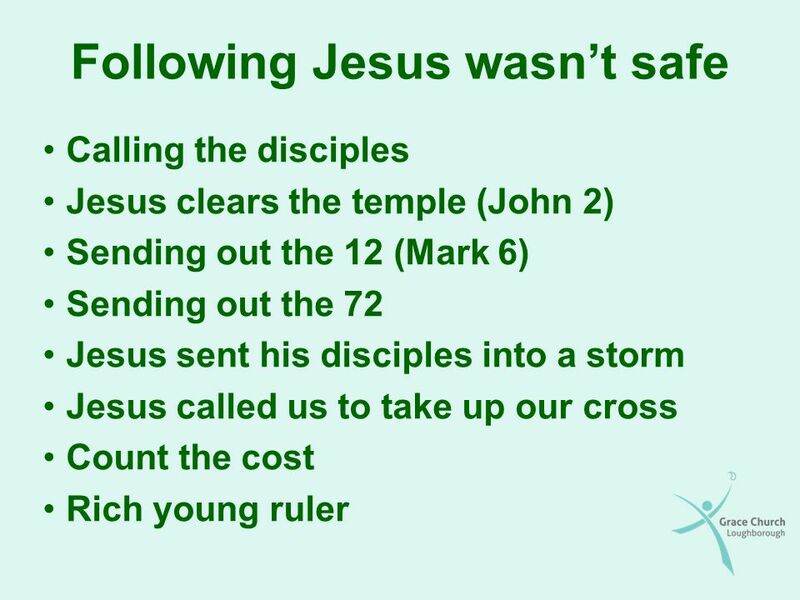 Matt 27:57-61; Mark 15:42-47; Luke 23:50-56; John 19: Congregational Theme: Daily Disciples: Obedience. Chapter 11 Jesus’ Resurrection. Journal Reflection: Phillip’s Story What do you think is the meaning of the story? 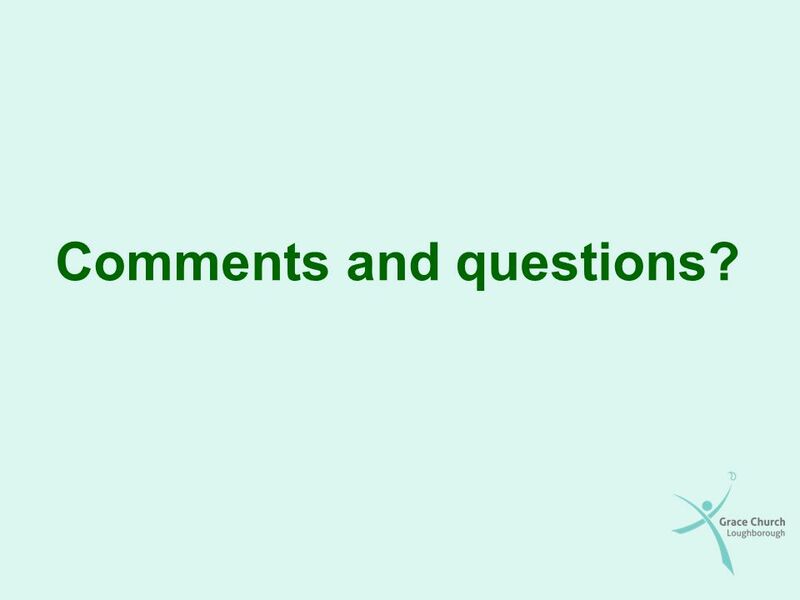 This presentation is licensed for use on a single computer and is non-transferable. This presentation works best with Microsoft PowerPoint The teaching. FAITH explained Hebrews 11. The path into God’s presence Heb 11:6 – But without FAITH it is impossible to please Him, for he who comes to God must believe.